A lighter version of the traditional Italian dessert, these individual puds can be made in advance. Add the Tia Maria to the cooled coffee. Dip 12-16 of the biscotti into the liquid, one at a time, then immediately divide between 4 x 250-300ml teacups, placing the biscotti in the base of each. Spoon half the mascarpone mixture over the biscuits in each teacup. Dip the remaining biscuits, one at a time, in the liquid and place in equal amounts in each teacup. Sprinkle over a thin layer of grated chocolate. Divide the remaining mascarpone mixture between the teacups and top with a liberal dusting of sifted cocoa powder. Chill for at least 2 hours to allow the flavours to develop. This dessert can also be made in a large glass trifle dish. For a richer version, use full-fat mascarpone instead of the light version. For easy entertaining, make the day before and store in the fridge. 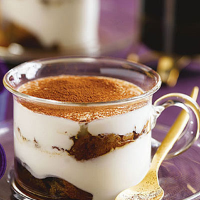 Enjoy this delightful Italian dessert with a glass of one of its main ingredients – Tia Maria Liqueur Spirit.